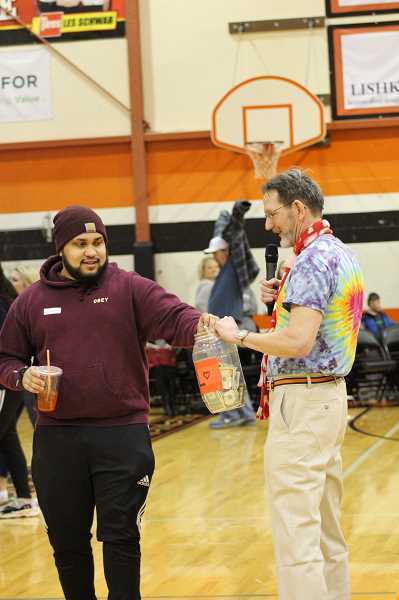 The community of Molalla is once again coming together for the annual Share the Love fundraiser, an event organized by Molalla High School leadership that benefits selected local persons or families who are struggling under the weight of difficult circumstances. 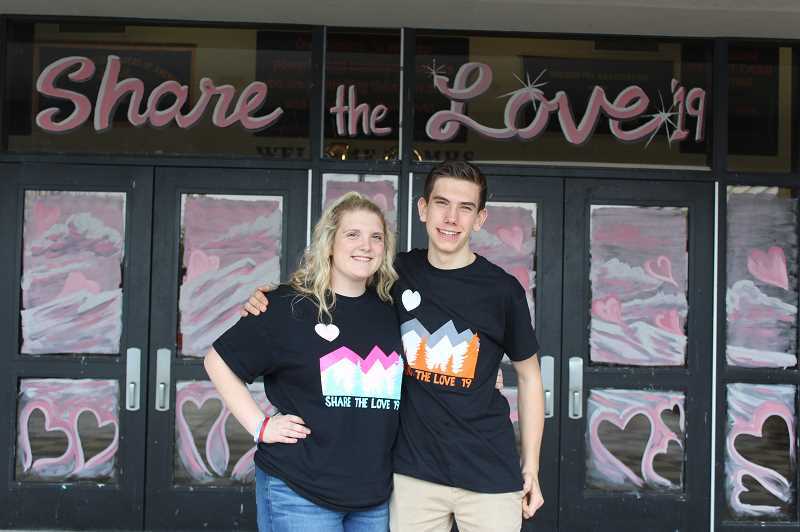 Leadership kicked off Share the Love on Friday, Feb. 1 with the opening assembly at Molalla High. The Share the Love court was introduced, and of course Share the Love founder Dr. Joe Zenisek (aka Dr. Z) spoke, but the primary purpose of the assembly was to introduce this year's Share the Love recipients. They are: the Burroughs family, Jollene Hall, Shayla Eatherton and Ana Wakefield. 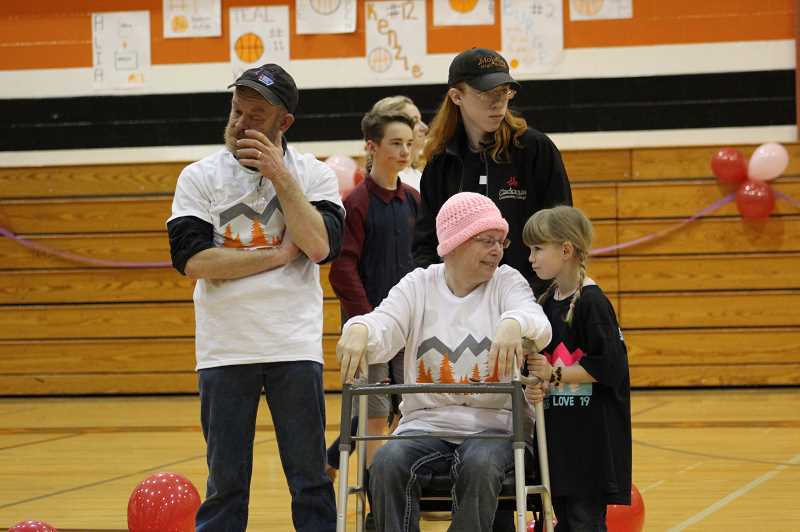 Molalla resident Deanna Burroughs was diagnosed in April 2018 with metastatic breast cancer, along with brain tumors, bone cancer and cancerous liver spots. After struggling with chemotherapy and infection for much of the summer, Deanna was moved to a care facility where she stayed until mid-October. Deanna's husband, Jake Burroughs, was unable to work because of Deanna's many complications, and as a result, the family, which includes the couple's three children, is struggling financially. "It is a struggle just to pay the required bills plus buy groceries," said the nomination letter. Deanna has been involved in Molalla Kiwanis, Molalla FFA Alumni, Oregon Hunters Association and Relay for Life. "We've put a lot of hours into this community volunteering, and to have it come back, tenfold, is amazing," Deanna said. "You never expect it," Jake added. "You don't want it back." Since she was diagnosed with inoperable pancreatic cancer in September 2018, former Molalla educator Jollene Hall has told everyone around her that she has both a tribe (the people who are helping manage her cancer day to day), and an army (the people who are praying for her around the world). Hall worked with special education students in the Molalla River School District for 15 years before retiring in 2018 and moving to Florence, Oregon. She had started a new teaching job to support herself financially until she was able to collect social security benefits. She had been on the job for less than a month when, on her 59th birthday, her doctor told her to go to the emergency room as soon as possible. Shortly after, Hall was diagnosed. "There is no cure for pancreatic cancer except divine intervention by a high power," Hall wrote in an informational letter to Share the Love. She later elaborated, saying while there's no medical intervention that can make her cancer-free, she does believe in divine intervention. Due to her short time on the Florence job, Hall was ineligible for medical leave, has been turned down for short-term disability (she's still fighting this), and has no source of income. She has moved in with Molalla River Middle School teacher Tonia Boyer, who is allowing her to stay at no cost. "Right now, 2019 is looking very grim," Boyer said in a letter to Share the Love. "She is in great need of financial assistance. "I am hopeful that her 'Molalla army' comes through for her in a big way," Boyer added. Hall has been a longtime fan of Share the Love, and expressed utter gratitude to now be a recipient. 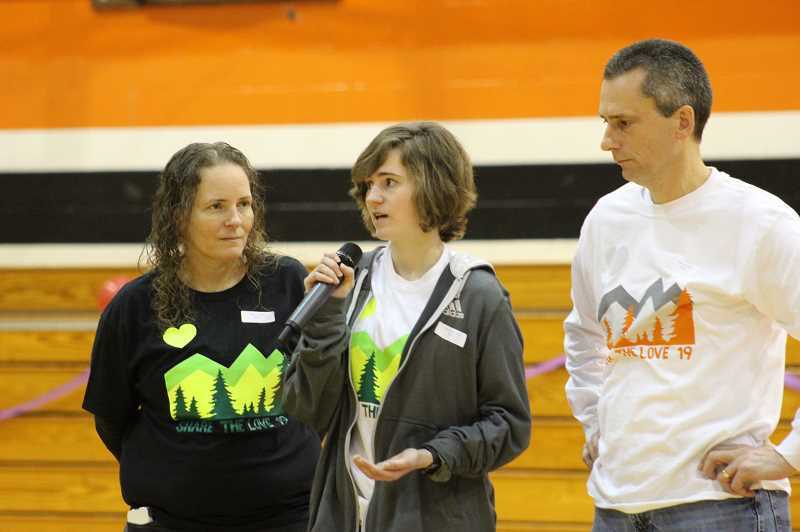 Molalla High School student Shayla Eatherton was involved in a four-wheeler accident in August 2018, fracturing her back in several places. Eatherton endured surgery to place rods and screws into her back. She came home from the hospital on Aug. 28, and her house burned down on Aug. 29. Eatherton and family members, including her mother Misty Summers and brother Dillan and his family, have been displaced since the fire. "We haven't got a house since the fire because she's been in and out of the hospital, and she's had multiple surgeries," Summers said. "So, we really haven't got to process the fire yet because she's been so sick." Summers has been working to pay Eatherton's medical bills and to try to secure a place to live. Gwynivere Mclellan and Ashley Mclellan, who wrote Share the Love on the family's behalf, said even though the family members have very little, they are still always willing to help anyone they can in any way they can. The Mclellans said Share the Love could help the family move forward and begin to heal. Summers said Share the Love has the potential to give the family "a new start." On Oct. 18, 2017, Ana Wakefield was on her way to basketball practice at Multnomah University, where she was attending on both academic and athletic scholarships and where she was the starting shooting guard for the basketball team. But she didn't make it to practice that morning. Instead, she was hit by a drunk-driver in a stolen car. Even worse, the driver ran away. Ana was transported to Oregon Health & Science University, where she received multiple brain surgeries and spent months fighting for her life. "When I got my first look at Ana, I couldn't stop the tears from flowing; Ana was unrecognizable," her father Dave Wakefield wrote in his victim's impact statement. "Her head was wrapped in bloody bandages, breathing tubes were attached because this college athlete could no longer breathe on her own. External fixators were attached, daunting bandages and machinery were hooked to her. "The person in the bed did not look like my daughter." Miraculously, Ana began to recover, but her medical needs have been extensive. Dave was forced to take a year off of his job as teacher and athletic director to care for his daughter. Now Ana, who still has limitations and ongoing medical needs, wishes to become more independent. So her family is building her an accessory dwelling unit. "She is determined to become all that she is capable of, to be a working productive member of society," said Tracy Cox, of Mulino in a letter to Share the Love. "She needs help to achieve this." The medical bills and loss of work have taken a financial toll on her family, and Ana cannot work or drive in her current condition. Even though one person has taken much from Ana, through her experience and through Share the Love, she sees the good in others. "There's some people out there who have made mistakes that can affect your life," Ana said, "but there's also people who can make very good decisions that can affect your life as well." Dave and Ana wanted to express their thanks to the community for standing behind them through Share the Love. 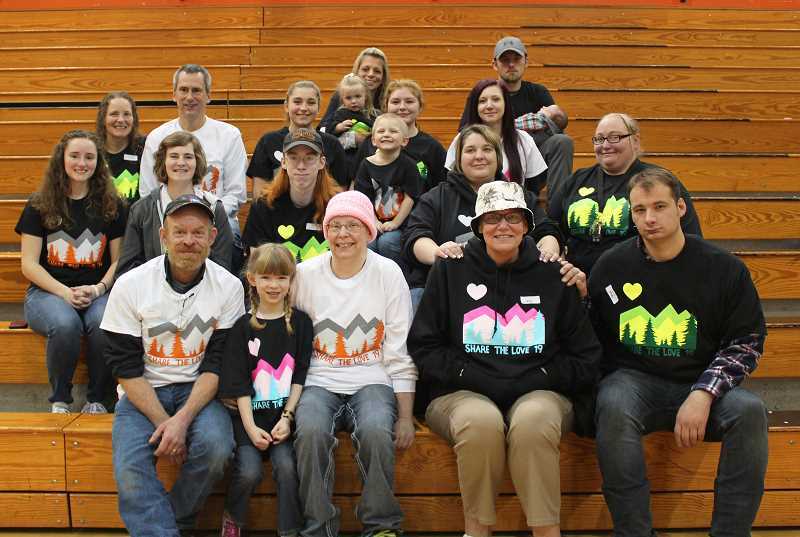 To help these four families, the Share the Love fundraiser continues for the weeks leading up to the closing assembly on Feb. 22, when the final dollar amount will be revealed.